This is a good skating and puckhandling drill for all ages. This drill can also be performed with or without pucks. More advanced players can add players and a shot at the end. It can be a good overspeed drill as well when you emphasize players moving thier feet faster than than they are comfortable with. Place the pucks in opposite corners with two equal lines of players. One player will go at a time with a puck. They carry the puck up the wall and cross over into the middle of the ice in a circle. At the bottom of the circle they will transition backwards and then pivot forwards again while maintaining control of the puck. 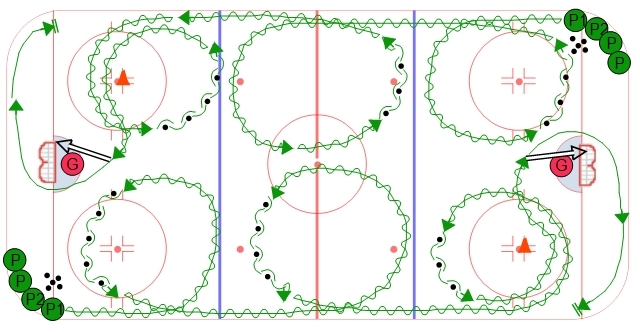 Once the first player completes the circle and is skating up ice the next player in line can go. The players do this once in each zone for a total of three times. After they do this in the offensive zone they turn sharply off the wall and cut to the middle of the ice for a shot on net. The shot on net is good for goalies and players as they both get to work on a situation where the player is coming through the slot area from side to side. This is one of many great drills you can run out of the corner so it can be a good idea to have a handful of these drills ready and run them back to back. It gives the players a lot of reps with skating and puck control.